Good question! Will Crockett is known in the photo industry as the founding father of hybrid photography and of the Talking Portrait as we know it. Take a look at his bio below to see his pedigree - he's the real deal - part creative photographer guy and part super techy developer dude. PortraitLink is the worlds first hybrid lab and we created the system, the training, most of the terms for the tools and we think it will revolutionize the photo world. Let's see? Here’s a funny bio video from one of Will’s seminar tours a few years back. His hair is a little lighter, so is his waistline, but he is still the same guy as you see here. Will Crockett is one of Americas premier hybrid photographers and is honored to be the creator of the “Talking Portrait”. Starting his career as a commercial and editorial photographer in the 90’s, Will rose quickly to prominence with a fresh engaging photographic style of portraiture than brought him assignments for TIME, NEWSWEEK, PEOPLE and TV GUIDE magazines before the age of 30. Best known in the photo industry as a seminar speaker, Will enjoyed presenting over 250 speaking events all over the globe on topics related to shooting smarter instead of harder. 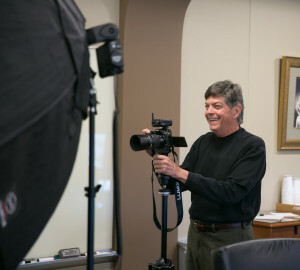 His award-winning ShootSmarter DVD Series produced 34 titles found in most camera stores in the US and Europe before it became the first professional photo video series sold on Amazon.com. These days Will is focussed on launching the world’s first system for producing high volume non-printed photo “eProducts” that combine still, video and audio files into beautiful portraits that talk, dance, sing and laugh on customers phones and social pages. Will is currently based in California’s central coast and is the CEO of PortraitLink.pro - the photo industries first hybrid lab. I photograph people, telling their stories visually. I’ve never really considered it “work”. It’s a passion. It’s my craft. A lifetime spent looking thru the camera viewfinder gives me a sixth sense to be in the right places at the right times to capture decisive moments. This expertise comes from years of photojournalistic, reportage and DOCUMENTARY PHOTOGRAPHY FOR NATIONAL MAGAZINES, corporations, HEALTHCARE, higher education and other public sector firms. I also share a Pulitzer Prize in Journalism awarded in 2000 to the editorial staff of The Denver Post where I worked as a Photo Editor and Photographer. It’s my belief that a strong, successful photograph is worth 1,000 words. I’m a published author: “MASTER’S GUIDE TO OFF-CAMERA FLASH” and “FLASH PHOTOGRAPHY” are available at Amazon. These books are designed to help aspiring photographers with lighting – a key ingredient in successful photography. Colorado’s always been home – a great place to raise 2 sons (now grown and on their own). My life has been enriched thru an 18 year YOGA PRACTICE and certification as a yoga instructor. I’ve also discovered the beauty and tranquility beneath the ocean’s surface as a SCUBA diver. Did I mention Foodie? Yep, been taking cooking classes from CHEF MARK at Sur la Table. Last, but not least, learning to play the harmonica! Can I help you tell a story? EMAIL or call Barry to get the ball rolling.